Do You LIke Money????? Giveaway Time! My Spring Break is almost over. I can't believe the end of the school year is almost here. I haven't been blogging too much because I have had so much going on that I decided it was time to get started again. 3. Post this giveaway on your blog and leave 2 messages for 2 extra entries!!! I have just uploaded my Cinco De Mayo pack to TPT. 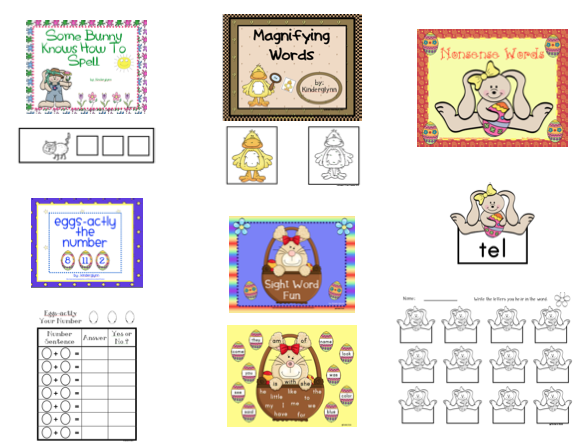 It is filled with 102 pages of math and literacy centers. 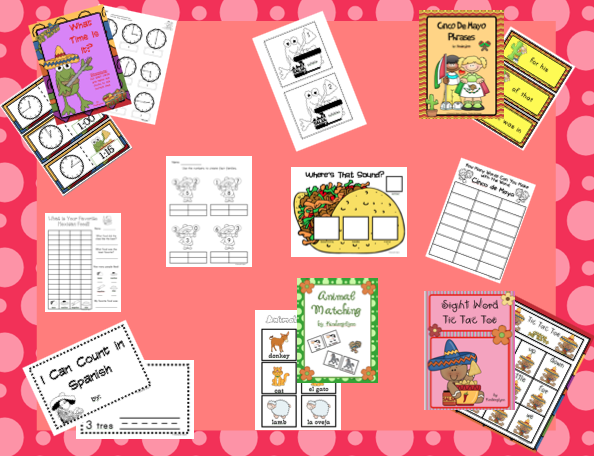 Fact Families, Vowel Sorts, Syllables, Emergent Readers, Learning Spanish Words and so much more. Check it out here. How exciting that everyone is giving away wonderful things this week. 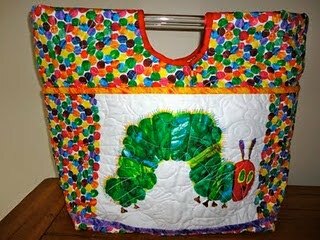 Did you see the adorable bag from First Grade Best? If not click here and go over and enter their giveaway. Check out First Grade Fundamentals free gift card giveaway. Are you looking for an extra 20.00 dollars to splurge on yourself? She has a choice of TPT, Dollar Tree or Target. 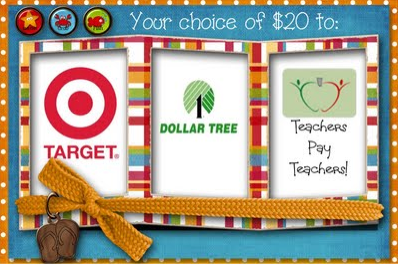 If you are like me, I am sure these are your favorite stores ever, especially for your classroom! Head on over and check it out. 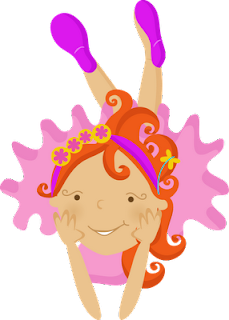 If you have not seen KinderKaren's new blog go check her out. She is also giving away her new Bug Unit! Click Here. 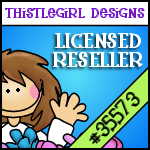 To all those Pampered Chef fans, check out Jennifer's new cooking blog. She is having a great giveway now so jump on over. Fantastic recipes! 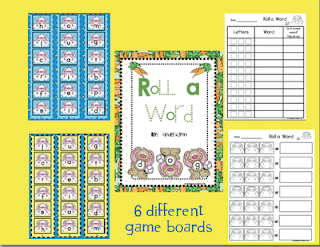 As everyone knows, I love Roll a Games. 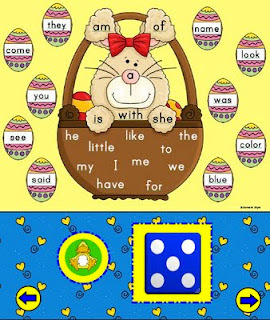 This cute little game helps my little ones make CVC words. They love saying that is a real word or that is a nonsense word. I love that they are learning their vowel sounds!! Click here to see more. 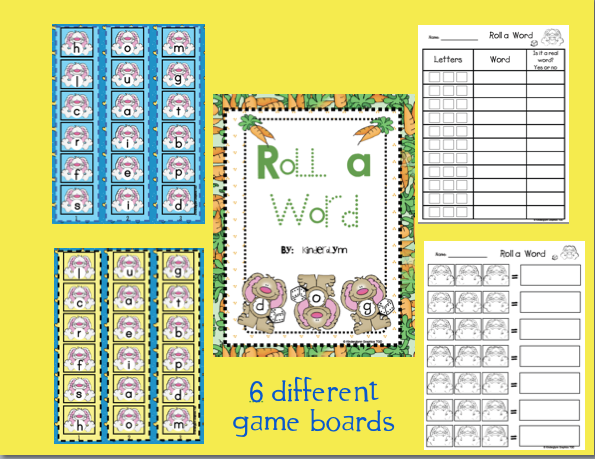 There are 6 different game boards and 2 recording sheets to meet the needs of your learners. 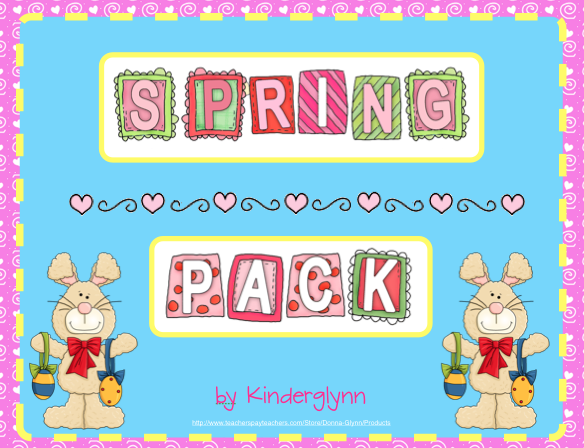 I made this activity to go with one of the games in my Spring Pack. I really like to model things on the "Big Screen" for my little ones. The love playing this game! I am finally done my Spring Time Fun Unit. 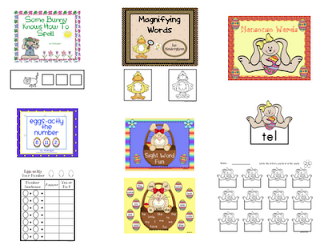 It consists of 98 pages / 10 different math and literacy centers! This Friday starts Spring Break for us. I can not wait. All my little ones keep asking if "tomorrow" starts Spring Break. I can't wait to tell them on Thursday, "Yes, tomorrow is Spring Break." They will be so excited. 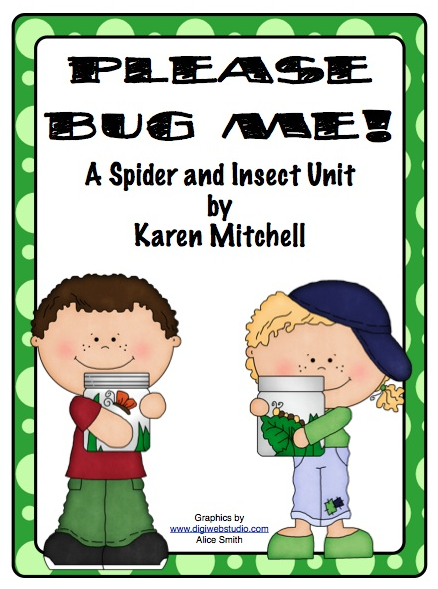 Here is the link to my Spring Time Fun Unit. Click Here. 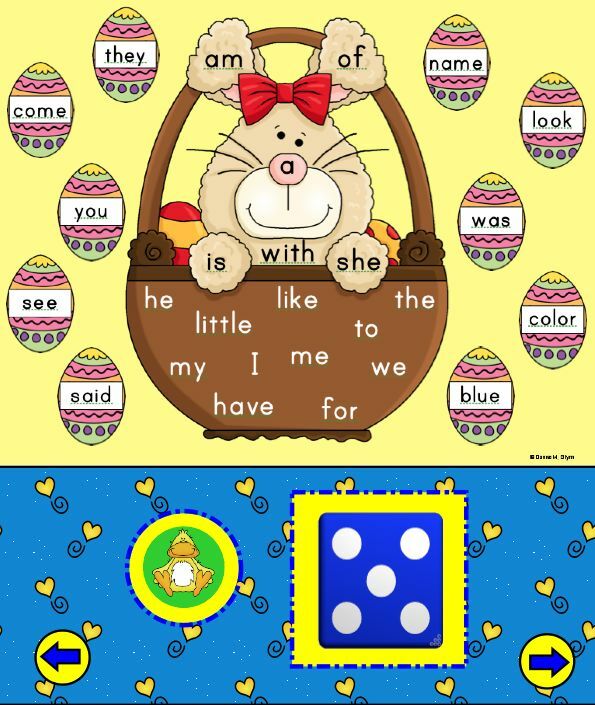 Also, I made a matching smart board file to one of the games in the pack called, Sight Word Bunny. 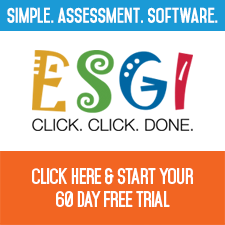 Click here to see the smart board file. Have a great week! 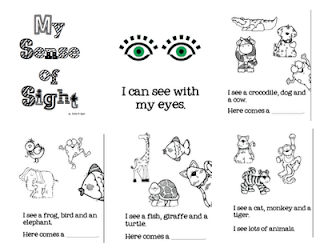 Hop on over to Mrs. Freshwater's Class Blog. 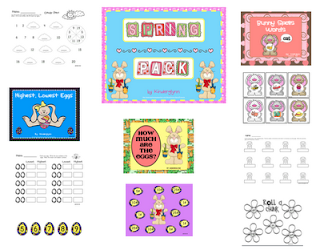 You could win her adorable Hippity Hoppity Addition Cards and her Hippity Hoppity Measurement Activity, plus her Incredible Insects Math & Literacy Centers. 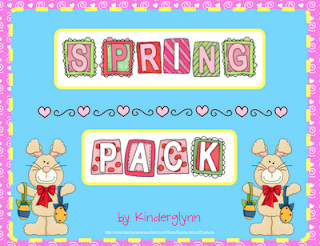 She will be giving away a total of three "Spring Themed Fun" downloads to the lucky winner. Sorry I have not been around. I am really looking forward to Spring Break, but I have to make it to the end of the month! On the bright side, I am hoping for nice warm weather! The most amazing thing happened in March. I was nominated Teacher of the Year in my school. It is certainly an honor. I have been working really hard on my portfolio all month and I am really sorry I have not gotten a chance to post things or create things for everyone. I have all your emails and I promise to start within the next week. 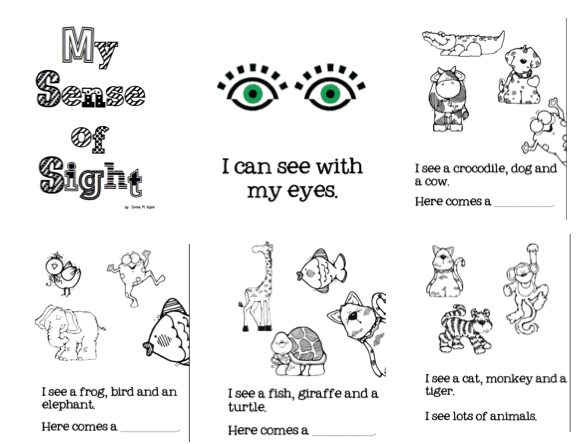 In the meantime, we just finished up our Senses Unit and I forgot I had made this book a few years ago. Please feel free to download it for free here.